We don't like to toot our own horn, but this macaroni and cheese is an absolute must-have! The creamy gouda and sweet caramelized onions are just out of this world. The buttery bread crumb topping adds a nice crunch, and the orecchiette pasta holds the cheese sauce beautifully. We actually think gouda may be the best and most underutilized cheese for macaroni and cheese. It's mild, yet interesting, melts perfectly, and stays gooey for a long time. It won't congeal easily and it sticks to noodles without getting stringy. Just make sure to take your time properly caramelizing the onions. (No cheating and just adding some sugar to the onions so they turn brown.) They need to be cooked slowly over a longer period of time on a medium-low heat, in order to get soft, sweet and buttery. You should be able to barely press on the onion and it will show it's softness. 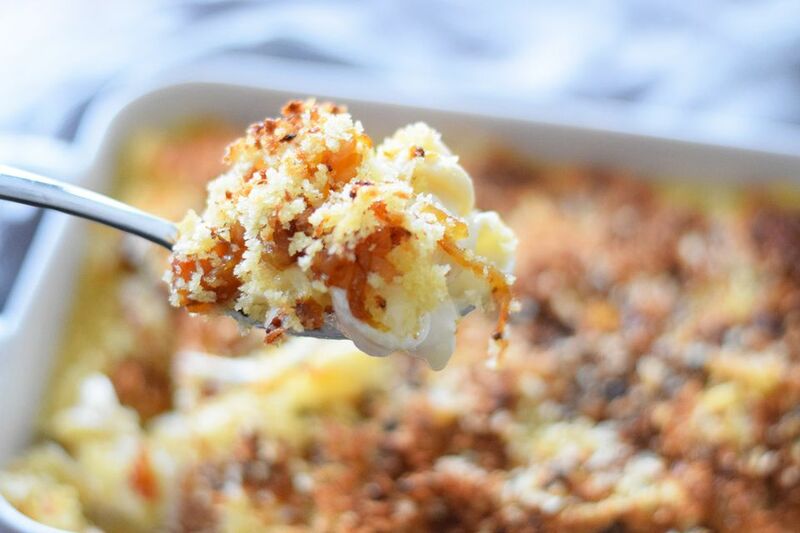 You won't want to eat any other macaroni and cheese recipe every again. Heat the olive oil and butter in a medium sized sauté pan over medium-low heat. Add the onions to the pan and spread them evenly. Sprinkle salt over the onions. Stir the onions every few minutes until they are caramel colored, fragrant and completely soft, about 30 minutes. Set the onions aside and begin the pasta. Cook the orecchiette according to package directions, leaving the pasta al dente. Set the pasta aside and make the cheese sauce. Add the butter to a large pot over medium heat. Once the butter has melted, whisk in the flour. Cook the butter and flour mixture for about 3 minutes, stirring frequently, to cook off the flour taste. Add the milk and whisk until combined. Heat the milk mixture until it is hot, but not boiling. Slowly add in the cheeses and whisk until they are melted. Add the salt and pepper and stir. Take off of the heat. Add the breadcrumbs to the melted butter and stir to combine. Butter a 9x13-inch casserole dish and add the prepared macaroni and cheese mixture. Top the macaroni and cheese with the caramelized onions. Cover the top with the buttered breadcrumbs and place in the oven on a center rack. Bake for about 20 minutes, until the top is golden brown and the edges are bubbly.